Home » Posts » Attentionology for K-5 Teachers » Track Cat is Trending! 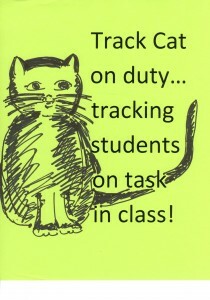 Track Cat is on duty…tracking students who stay focused and on task in class. Today’s world is full of trending icons, images and information teachers can adapt for educational purposes – tools and tricks for classroom management and use as hooks into lessons. Here’s a clever way to transform one popular trend…a certain cat by a name other than Track Cat who is wildly popular online and in stores at the present time. Track Cat resembles this cat. I’ve posted a quick illustration of Track Cat here. Track Cat’s job is to encourage students to pay attention in school. You can you turn Track Cat into an attentionology tool by simply projecting or drawing a large cat on a white board or screen. Note its name and purpose next to the feline. Background – Some months ago, my daughter dropped an Appointment Reminder card on the kitchen table for our cat’s annual visit to the animal clinic we use. I glanced at the appointment date and time, written in thick black ink, but my eye was also drawn to the small illustration inside a colored box at the bottom of the card. A calico cat stood with tail up and a wide smile. Looking more closely at the colorful cat, I was reminded of “Tracker,” a pet that a local television station uses as a weather tracker mascot. Not wanting to copy the TV station exactly, another thought came to mind. I decided to turn the colorful cat in the box with the green background into Track Cat. 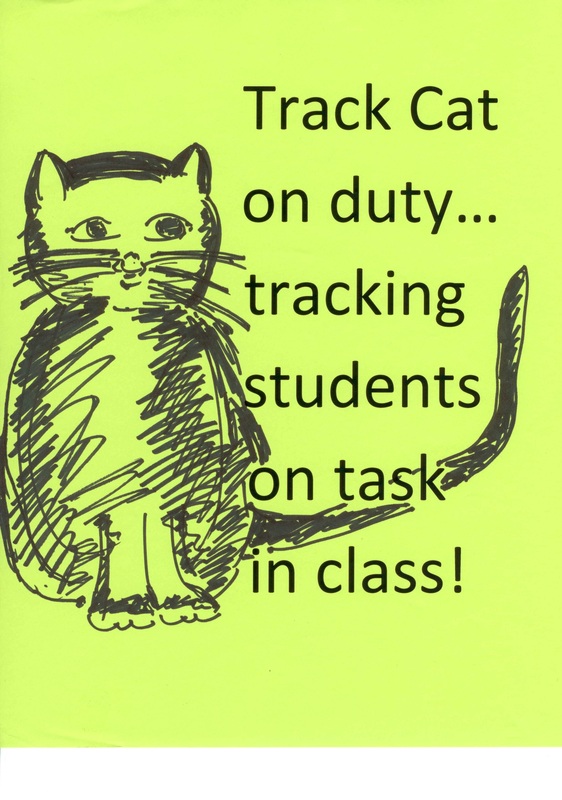 Track Cat Today – Track Cat is on duty helping students monitor their progress staying on task in class. Choose an image for Track Cat with a personality that suits your class. me, a teacher. It just took a little time, lookout eyes and a creative mind for me to see new possibilities in a cute illustration on a card. Track Cat’s Future – I plan to create simple Track Cat cards on my computer (all kinds of software applications are available for designing and printing your own cards). I’ll write the appropriate curriculum area, such as Math or Reading in the blank space I print out on my cards. 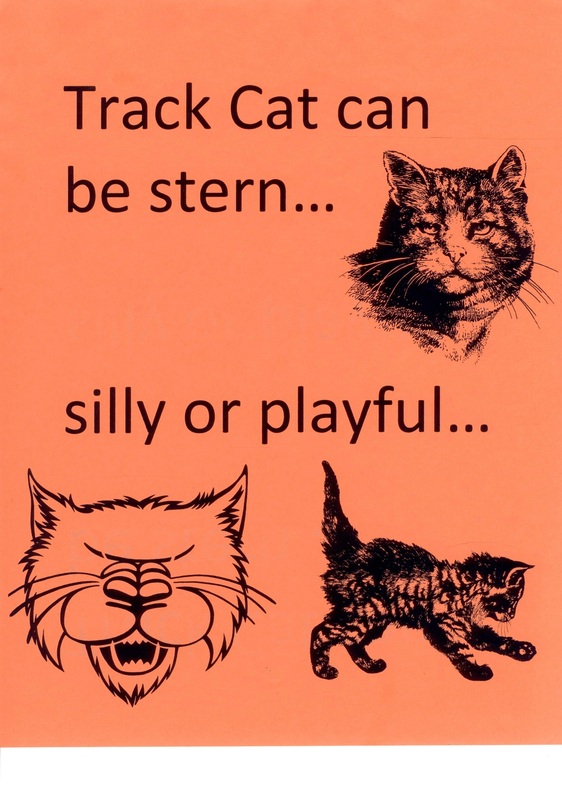 When students need a “Track Cat” message, I’ll drop a card on their desks while they’re seated and maybe even add a soft “Meow” as I do so. My cards will also include a thank you from “Track Cat” for good future work, to soften the admonition. However you decide to introduce Track Cat to your class, this easy-to-make-and-use tool can give students PAWS to pay better attention. I’m always on the lookout for practical and/or promotional materials that, with a new twist, can be turned into effective tools to catch and keep students’ attention. Please send comments about resources you’ve adapted for your classroom. Stop by on Wednesday for Mid-Week Focus. ‹ Share a Harvest of Attention-Getting Thanks!